I mentioned the Aromatherapy Associates Hydrating Rose Face Mask in my magazine haul post last week. 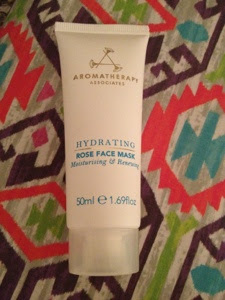 One of the freebies on the front of Red magazine, this hydrating mask was calling to be used the second I got it home. Aromatherapy Associates are a luxury spa brand that use essential oils and plant extracts across their range of bath, body and skincare. Designed for dry skin, the moisture mask contains aloe vera and sodium hyalauronate to hydrate and damask rose water for cooling. The mask is a light gel texture which surprised me - I think I was expecting some sort of heavy cream! You apply it to cleansed skin and leave on for 10 minutes before rinsing off with warm water. It can also be applied as an overnight mask and allow to sink in whilst sleeping. I've done both over the past week and have been pretty impressed. My skin is more dehydrated than dry, and I was surprised at how quickly it sucked all the mask up the first time I used it. I actually reapplied another thin layer as most of it was abosrbed under 5 minutes (damn you cold weather). I've also tried it overnight on my really dry areas and have woken up to much softer, more moisturised skin. This mask would normally retail for £36 for a 100ml tube. The freebie from Red is a massive 50ml - worth £18! Considering the magazine only costs £4, it's a bit of a bargain. I think I'll be going back for another copy pronto. Have you picked up this freebie? I got this earlier in the week but haven't got round to trying it yet - will definitely be giving it a go this weekend! me too - such a bargain!